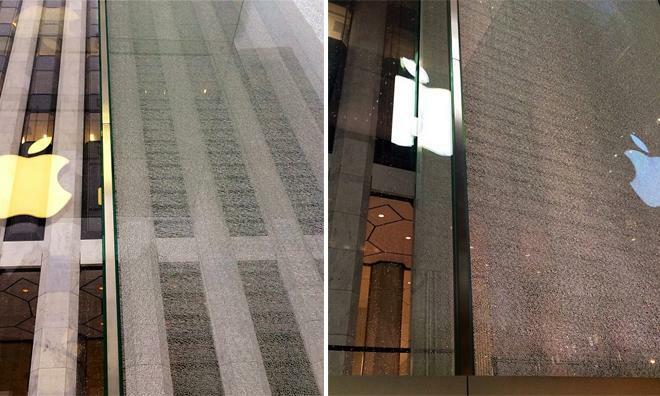 After a heavy snowstorm hit New York on Tuesday, clean up crews using snowblowers reportedly shattered one of the fifteen monolithic glass panels that make up the Fifth Avenue Apple Store's iconic 32-foot glass cube. An Apple Store employee confirmed to AppleInsider that a single pane positioned in the southeast corner of the cube was badly cracked, but said the store has remained open since the incident and will continue to operate as normal. Apple's Fifth Ave. location is open 24 hours a day, seven days a week. Word of the breakage first hit the Web late Tuesday as users of social networks posted pictures of the shattered glass slab to services like Instagram and Facebook. In a separate report, an Apple representative told BuzzFeed that a snowblower caused the damage, though exact details of the incident were not revealed. Apple first unveiled the now-iconic glass cube —said to be designed by late cofounder Steve Jobs —in May of 2006, and the location has become one of the most photographed sites in the area. The company revamped the huge structure's design five years later by replacing what was originally 90 sheets of glass with only 15 large panes. According to reports at the time, the project cost an estimated $6.7 million, including removal of the old unit, installation of the new design and renovation of the surrounding area. Tuesday wasn't the first time Apple's Fifth Ave. landmark had a run-in with bad weather. Last May, the underground store flooded after water made its way into the cube during a heavy rainstorm. The outlet remained open and later reports cited drainage issues as the culprit.